Ben Leigh has spent a couple of special moments photographing the African wild dog – a species perhaps less famous than some of the other African carnivores, but a stunning specimen worthy of attention. These highly social animals are also the second-most endangered carnivore in South Africa, and Ben shares some of his stunning images in this photography feature. My love for wildlife and conservation began when I was just a small boy. I would often sit and watch mesmerising documentaries on all kinds of wonderful creatures, but one in particular always got me excited: the African wild dog. Their elegant yet purposeful strut, combined with the incredibly striking markings gifted to them, gave me a sense of awe which still remains to this day. The pure beauty of the African wild dog is one of the key motives behind my love for photography. I don’t think anybody can deny that these are remarkably photogenic animals that help us as photographers portray them in the way in which they deserve. It is an upsetting thought to think that these wonderful creatures could one day be extinct in their natural habitats if we do not provide them with sufficient support. It is not unreasonable to say that we might owe it to them too, as in many cases it is humans who are the cause of problems for wild dogs. They are currently classified as Endangered and have been so for over 20 years now by the IUCN. A mere 6,600 adults remain with an even more astonishing number of only 1,400 being fully grown. The wild dog’s range has reduced significantly from its original spread as they are now native in only 19 countries across Africa. None of these countries have large populations, making the African wild dog an extremely rare sighting, but a truly special one if you are lucky enough. In my photography career I have only been blessed with two sightings of these magnificent animals, one of a trio of adolescent males in Madikwe Game Reserve and the other in the famous Kruger National Park where we were treated to a pack of around 20+. The African wild dog is fighting on various fronts when it comes to threats against their existence. As mentioned, humans are the main danger, but not only via purposeful targeted killings from poachers as many might assume. Humans are also the instigators of reducing territories and habitats that wild dogs roam in. These habitats continue to be lost to this day for human resources and consumption and it is clear that important conservation plans need to be implemented in order for the species to survive long term. 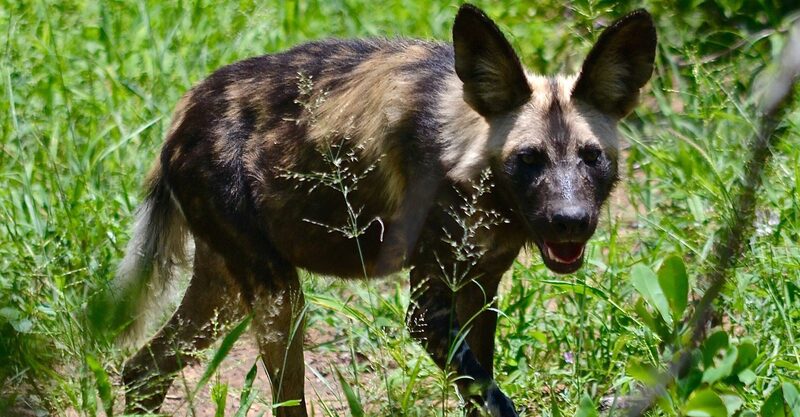 There are a few reasons why habitat loss is so disastrous for wild dogs: one is that they lose vital living space from what is home to a tightknit community of predators and unfortunately, wild dogs come close to the lower end of the pecking order. Secondly, habitat loss forces prey that is already so sought after to relocate, meaning it becomes increasingly difficult for wild dogs to successfully hunt regularly. Failure to feed large packs that can contain up to 40 hungry individuals will have devastating repercussions. Wild dogs’ hunting strategy is based predominantly on stamina. Luckily, this is something they have in abundance. They can track and pursue prey for long periods of time and hunts can often carry them up to five kilometers away from where they began hunting. I have experienced firsthand the lengths that these animals go to in order to survive as I followed a small pack of three for over an hour in search of that prized meal. The enormity of the task was evident right away. As we followed, it was a big enough task for us to keep up with them even with the advantage of our Jeep. Every so often they would pause from their fast-paced jog and put their iconic ears to use, listening closely for any kind of opportunity. Every time it looked as if they were onto something, it quickly fizzled out and they continued their quest. It was somewhat upsetting to watch as they finally had to give up with nothing arising from the venture and contemplating where their next meal might come from. This highlights the struggles these animals go through on a day to day basis, not to mention the competition they face from other predators and opportunistic scavengers such as hyenas. However, regardless of all these troubles, the African wild dog is still regarded as one of the continent’s most efficient hunters. The African wild dogs’ social nature is key to their success. The species’ ability to adapt to living in packs as small as two to three, or as big as 40 individuals, is fascinating. And the structure they apply never changes: they operate via a hierarchical system but have separate dominant hierarchies for both genders. So in each pack there will be a dominant pair rather than a leading individual, with the remainder of the pack abiding by their ruling. It seems evident through watching them, however, that males tend to be the dominant gender – they outweigh females 3:1 on average within regular packs. Often it is found that packs are comprised of related males and females, meaning that the bonds they acquire are more unique than any other social species. The behaviour seen in wild dogs is exclusive and special to only them, and therefore makes them irreplaceable in the animal world. I believe that I speak for all wildlife lovers when I say it would be truly heartbreaking if the African wild dog was not around for future generations to enjoy. The thing about wildlife conservation is that it’s easy to talk about what needs to be done in order to aid wonderful creatures of the world. The hard part is going out and making the difference by putting conservation ideas into practice. Any help, no matter how small or big, is an improvement as it all helps prolong the lives of these special animals. I hope that anyone who is lucky enough to encounter wild dogs on their adventures takes a moment, just as I did, to fully appreciate just how extraordinary they are. To support Ben’s work, follow this link to his Instagram feed. All images in ‘Picture Perfect: African Wild Dog’ by Ben Leigh – All Rights Reserved 2017.